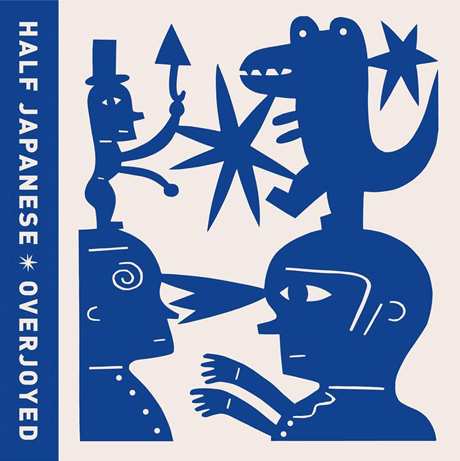 Half Japanese "In Its Pull"
If you were already overjoyed that lo-fi favourites Half Japanese are getting ready to release a new LP, also titled Overjoyed, then you're in for an early treat. Brother Jad and David Fair and the rest of the group have let loose a sneak preview called "In Its Pull." Keeping in mind how the album was previously described as "somehow accessible," "In Its Pull" seems to subvert '80s rock anthems via a rumbling, Michael Anthony-approved, one-note bass line. The track coagulates screwy guitar harmonies, nervous sprechesang vocals and a skittery six-string solos that keep this one far, far away from your dad's FM radio dial. You can check out the track down below, while Overjoyed arrives in full September 3 via Joyful Noise Recordings.